For someone who does not like orange flavored dessert, there is an awful lot of orange desserts here on this blog. If you were so inclined, you could make this pound cake, these biscotti, or these rolls. I don’t like okra either and you will NOT find an okra recipe here. Weird. Anyway, back in November, I made two birthday cakes for the 40th birthday party of one of my closest friends. She requested the cake that is quickly becoming my signature and another one of my choice. She has had years of my desserts and she trusts me. Because the chocolate cake is so rich, I thought I would try to balance it with something a little lighter. Still spectacular and nice and tall, but just not so intense. When I found a recipe for Grand Marnier cake in the book Sky High, I knew it was the one. Over the years, we have had many dinners with my friend and her husband and there was often Grand Marnier involved so it seemed like the perfect choice. The birthday girl loved it and so did her guests. One of her friends just hired me to make the exact same cakes for her husband’s birthday. For a 3-layer impressive-looking cake, this recipe is actually quite easy. The cakes themselves are a simple chiffon and the frosting comes together quickly and easily. Every time I make a layer cake, I start to panic once the assembly begins. Will it come together as it should? Will it be crooked? (Always yes to that one.) What if I run out of frosting? Then, What do I do with all this leftover frosting? If you imagine me to be a calm cool collected baker, do not come into my kitchen on cake assembly day. But this cake did not stress me out either time. It is a well-behaved cake. If you have never tried a layer cake before, this is a good place to start. Especially if you like orange. 1. Preheat the oven to 350°F. Line the bottom of three 9-inch round cake pans with parchment or waxed paper but do not grease the pans. 2. Sift the flour, 1 cup of the sugar, the baking soda, and salt into a large bowl; stir to blend. Whisk in the oil, egg yolks, orange juice, orange zest, and water until well blended. 3. Put the egg whites in a clean large mixer bowl with the cream of tartar and, using the whisk attachment of an electric mixer, beat until frothy. Slowly add the remaining ½ cup sugar an whip until soft peaks form. Do not overbeat or the cake will be dry. 4. Add one-fourth of the beaten whites to the cake batter and fold them in to lighten the batter. Gently fold in the remaining whites just until no streaks remain. Divide the batter among the 3 prepared pans. Combine the sugar and water in a small saucepan. Bring to a simmer, stirring to dissolve the sugar. Continue to cook, without stirring, until the syrup is reduced to ½ cup. Remove from the heat. Let cool completely, then stir in Grand Marnier. 1. In a medium heatproof bowl, melt the white chocolate with ½ cup of the cream over barely simmering water. Stir until smooth. Remove from the heat and allow to cool to room temperature. Stir in the Grand Marnier and orange zest. 2. In a large chilled bowl with chilled beaters, whip the remaining 2 cups cream until almost completely stiff. Add the whipped cream to the white chocolate mixture and gently fold it in. I have to say, I’m not the biggest fan of orange. But in my experience, when you mix it with Grand Marnier, something magical happens. And so I trust you. It looks fabulous. oooo this looks and sounds so good! 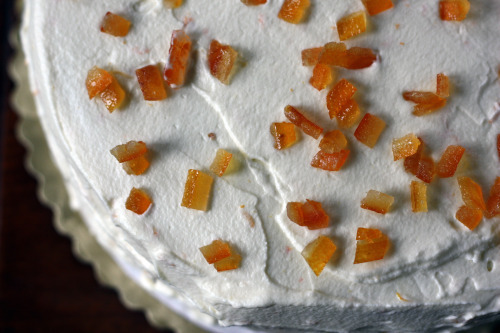 I love that you topped the cake with chopped orange zest. Ha! That’s funny, I always think I won’t have enough frosting and spread it too thin between the layers, then I end up with left-overs. Guess I’ll figure that one out some day! I’m not a huge orange flavored dessert person either (mostly the orange/chocolate variety), but sometimes I surprise myself! This cake looks good though! Agreed about okra. It’s horrible, isn’t it? What an impressive cake! As a huge fan of orange desserts, I would go crazy for this one. The cake is actually very similar to my favourite orange bundt cake and the frosting sounds scrummy. I do like orange and white chocolate, and this sounds lovely! The tiny flecks of orange zest in the white frosting are very pretty too. reminds me of crepes….remember those? i know random. your photo is breathtaking…. gorgeous cake!!! i especially love the top pick. soo fluffy and pretty!!!! with NO offense to your gorgeous cake, i hate orange desserts and okra too! Like those chocolate orangettes? i dont get it. However, you are becoming quite the cake lady, gorgeous Dana! I made that exact same cake this weekend for my grandmother’s 87th birthday! Except I didn’t want the white chocolate frosting so I made a buttercream flavored with orange juice, zest and triple sec and topped it with glaceed orange slices. I also replaced the water with orange juice in the cake batter. Beautiful cake! I love the orange peel on top. The cake is lovely, and I’ll be making one to celebrate our fifth anniversary next week. I have scoured the stores for candied orange peel, but have come up dry (I live in a small town) — do you have a solid recipe for it, by any chance? Best wishes for continued success, and plenty of cake to go with it! I did in fact make this for our anniversary party last night and people just loved it! I’ve already sent out one link to this page in response to a request for the recipe. 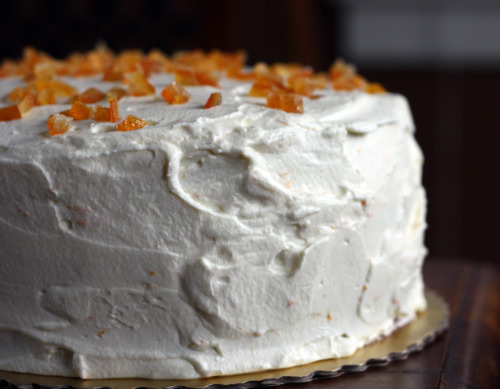 The only changes I made were to use an orange buttercream between the layers — when I did my test cake, the whipped cream frosting squished out when I cut into the cake — and I added a couple of tablespoons of leftover syrup to the whipped cream frosting for added flavor. Thanks again for a very tasty addition to my dessert arsenal!